No More Mr. Nice Pie is Back! In this episode Ellen ices cookies and discusses cookie decorating, what she's been up to, why she hates Con Marie-esque things, and what's coming up. This week on the piecast Ellen is joined by Drew (Master/Master). The two discuss gingerbread, Christmas cookies, and construction. Ellen celebrates a work anniversary this week and talks about her brief tenure in cookie decorating. This week on the piecast Ellen is joined by Maggie (Blondielocks). The two discuss the aftermath of Thanksgiving, pie discrimination , No More Mr. Nice Pie's greatest addiction, and more. 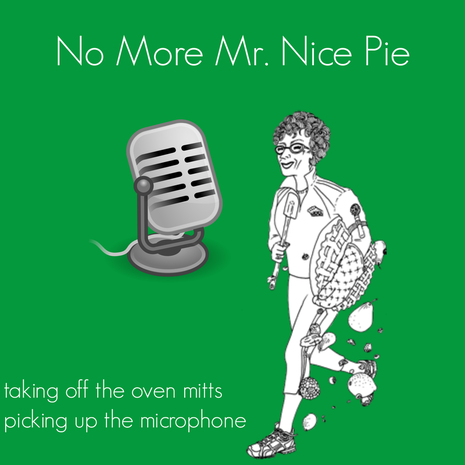 Welcome to the first episode of the No More Mr. Nice Pie Podcast! In this episode, Ellen gives her best tips and tricks for preparing for Thanksgiving. She answers questions that give her readers pie-anxiety ranging from perfecting a flakey crust and avoiding a soggy bottom to staying ahead of the game as well as avoiding people with whom you don't wish to share pie with.